Experts working at the Horvat ‘Amuda site have said the drone images allowed them to pinpoint their dig. Drones flying over a military training area in Israel have revealed the location of an ancient temple built by the biblical Idumean people some 2,200 years ago. Subsequent excavations of the structure, spotted in military aerial photographs, uncovered a number of cultic jars and vessels and a rare hellenistic altar for the burning of incense decorated with the image of a bull. Experts working at the Horvat ‘Amuda site have said the drone images allowed them to pinpoint their dig, the Times of Israel reported. “This technology helped us choose where to focus our excavation probes, and, indeed, it very quickly emerged that this was in fact a unique discovery,” Oren Gutfeld of the Hebrew University, and Pablo Betzer and Michal Haber from the Israel Antiquities Authority said in a statement. 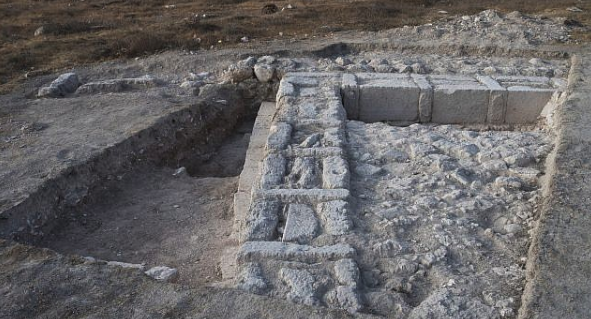 The temple discovered in the Lachish region military training area is just one of handful of Idumean buildings recovered in Israel. The ancient people settled across the holy lands until the civilization was wiped out by the Babylonians in B.C. 700. Trading across the region in the time of Alexander the Great they were eventually assimilated into the area’s Jewish population. The ancient carved city of Petra in modern Jordan remains one of the most prominent examples of remaining Idumean culture and architecture. Excavations at Horvat ‘Amuda revealed a series of rooms, one of them containing two stone incense altars. The bull image adorning one of them also showed the architecture of what appears to be a temple or a similar structure like a palace. “[This] may have symbolized a deity worshipped by the Idumeans,” Israel’s Archaeological Authority said in a statement. It added that as well as painted bowls, juglets and oil lamps made of delicate pottery the altar was a rare and significant find. The temple appears to have been dismantled on purpose rather than destroyed. Experts believe this may have occurred in around 112 B.C. during the conquests of the Hasmonean king, John Hyrcanus I. The Hasmonean dynasty that ruled Judea and the surrounding area at the time sacked Maresha, a nearby Idumean stronghold, home to 6,000-10,000 people. As part of the conquests locals were forced to convert to the Jewish faith or leave the area. Numerous archaeological discoveries have been made in and around Horvat ‘Amuda including remains dating from the Jewish revolts against the Romans in the second century.